Heat oven to 425°F. Line large cookie sheet with cooking parchment paper, or spray with cooking spray. Unroll crusts. Cut each into 4 wedges. In 10-inch nonstick skillet, cook beef over medium-high heat 5 to 7 minutes, stirring frequently, until thoroughly cooked; drain. Stir in chilies. Spoon about 2 tablespoons mixture over half of each crust wedge to within 1/4 inch of edges. Top each with 1 tablespoon cheese. Brush edges of crust with water. Fold untopped dough over filling, forming triangle; press edges to seal. Place on cookie sheet. Bake 12 to 17 minutes or until golden brown. Remove from cookie sheet to cooling rack. Cool 10 minutes. Spoon salsa into small bowl. Place bowl in center of serving platter. 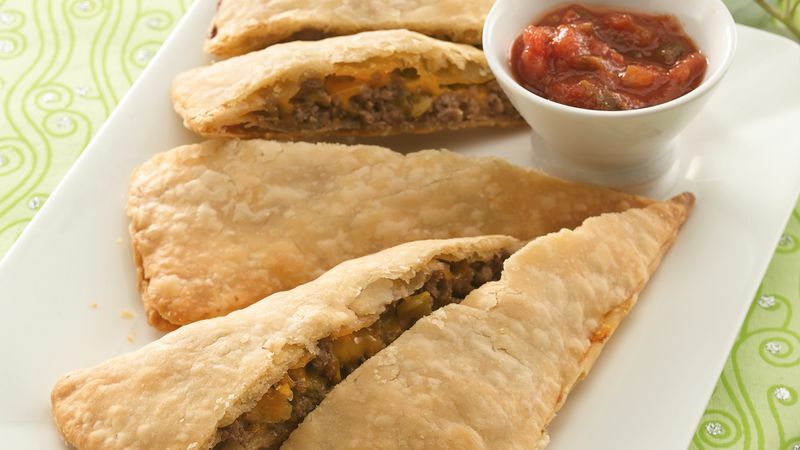 Cut each warm empanada in half, forming 2 triangles. Arrange around bowl. If you like cilantro, chop 1 tablespoon and add it to the empanada filling. Coarsely chopped smoked chorizo sausage can be used in place of the ground beef.